Remote adventure ski touring in the High Caucasus, skiing in the shadow of Shkhara, the highest mountain in Georgia. Our principal objective for the trip is to visit the ‘lost world’ village of Ushguli, exploring the surrounding mountains on ski. This remote and uniquely preserved Unesco World Heritage site is only accessible via a long 4WD journey. The village is surrounded by fantastic ski terrain and a backdrop of the huge 5000m peaks of the Bezingi Wall. 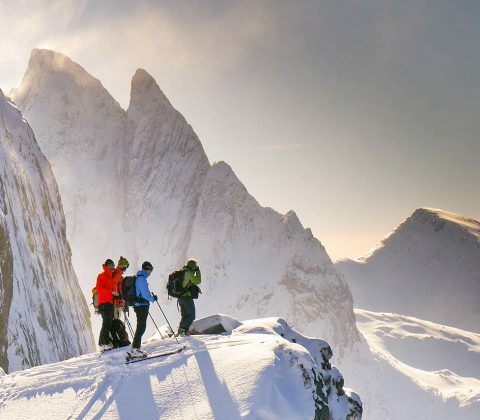 This is a remote trip, with 8 days of skiing for fit and experienced ski tourers, who already have previous hut to hut touring experience and are up for the challenge of some bigger (up to 1500m) skinning days. The terrain is extensive, with both north facing powder slopes and south facing spring snow slopes in the region. The trip also involves some difficult off road driving and we need to be more self-sufficient than on a typical ski touring trip to the Alps (see suitability notes below). Accommodation in Ushguli is at a local farm guesthouse; the food is great and the rooms have basic electric heating, but in communal areas and in the evenings it can get cold – so you need to bring a 2-3 season sleeping bag to supplement the bedding and a good down jacket for this part of the trip. NB This is an ‘off the beaten track’ ski trip to a less developed nation, so a flexible mindset and a sense of adventure are pre requisites to enjoy this type of holiday. Expect the unexpected and you’ll have a great time – but if you like everything to go like clockwork, then stick to skiing in Verbier and Zermatt! There is also some serious off road driving involved, which may leave you out of your comfort zone – you need to be aware of these factors before considering joining the tour. The remote village of Ushguli lies in the Svaneti region of the western Caucasus mountains of Georgia – the mountain range that runs between the Black Sea and Caspian Sea, forming the boundary between Europe and Asia. Bigger than the Alps and with numerous 4000 and 5000m peaks, the range is currently far less developed, especially in winter. The trip starts and ends with a days’ skiing near the town of Mestia, with main body of the trip being spent in Ushguli, using the village as a base to explore the surrounding mountains in a series of day tours. There is great skiing available in all directions – with excellent north facing powder bowls on one side, a lovely panorama summit right above the village and long spring snow tours up onto the flanks of Shkhara (at 5193m, the highest mountain in Georgia) and the other 5000ers that make up the famous Bezingi Wall, which dominates the skyline at the head of the valley. Although the village now sees regular visits by ski tourers, there is so much terrain that there are still plenty of fresh tracks for all. Georgia itself is also a culturally fascinating place to visit: it’s a Christian country with a passion for wine production (and enthusiastic consumption!) that has numerous incredibly well preserved 1000 year old monasteries, religious sites and other unique architecture – such as the famous Svan Towers that dominate towns and villages of the Svaneti region. We’ll have a chance to explore some of these cultural aspects of the country during our trip. It’s a westward looking nation that has come a long way since the end of the Soviet era and over the last 10 years, the infrastructure within Georgia has improved greatly; nowadays it’s one of the safest countries in the world to visit. Visas are not required by UK, EU, US, AUS and NZ citizens as well as those from 98 other nations. The trip starts at Luton Airport, where we meet up and fly to Kutaisi in Georgia. From Kutaisi the journey up to Mestia takes 5-6 hours where we break the journey and enjoy a days skiing, then it’s a further 2–4+hrs driving on narrow and difficult 4WD tracks to reach Ushguli. For the two days skiing in Mestia, we are picked up at the hotel by a 4WD vehicle in order to access the different ski venues. There are two small ski resorts in this area which offer good off piste skiing and lift assisted day touring, plus there are numerous good quality mid altitude day tours around Mestia. NB This trip travels on Thursday out/Sunday return, in order to make use of direct flights from London Luton to Kutaisi, the nearest international airport to the region. This is an advanced level trip. To take part you should be at Fitness Level 3-4 and Tech Level 3-4 (see our Fitness/Experience guidelines below). You need at least 3 weeks touring experience, including multi day hut tours and advanced level tours in order to join this trip. If you haven’t skied with us before, then a reference from a ski tour leader or guide will be required. You must be able to handle all off piste conditions whilst carrying a day sac, plus experience with ice axe and crampons is also needed. The trip includes 5-7 hour days with some steeper terrain, involving kick turns and the odd short boot track to reach summits. Typically we’ll be doing 1000-1500m of ascent a day, at up to 400m per hour ascent rate (skinning at altitude) – so you can expect to be skinning for 4-5 hours a day. Type of ascent: 90-100% skinning on this tour – approx. 9000m of skinning up, 10000m of skiing down. NB This is an adventurous tour, with some difficult off road driving and we need to be more self sufficient than on a typical ski touring trip to the Alps. The local mountain rescue team are well equipped and trained, but in the event of poor flying conditions, access could take longer than in western Europe, so we will be carrying a rescue sled for emergencies and we need to know that you are fit and experienced enough to deal with any unforseen difficulties, such as poor weather or snow conditions. All rooms are provided on a twin sharing basis, but if you wish to book a single room please let us know and we will confirm availability (usually Ok in Kutaisi and Mestia, but there are a limited number of rooms in Ushguli). Please let us know if you have any special dietary requirements. Fly from Luton to Kutaisi in western Georgia, overnight at Hotel in Kutaisi. NB The flight arrives very late (ie early Friday morning local time), so our first day in Georgia is planned for traveling and some sightseeing. Travel to Mestia. After breakfast, we make the 5-6hr transfer from Kutaisi up to Mestia. After 2 hours of flat driving, the road climbs spectacularly up into the mountains, passing through deep valleys and gorges. For most of the journey the road is pretty good, but gets a bit rougher towards the end, where we pass some of our potential ski venues for the week. Arriving at Mestia, we check in and have lunch, then spend the afternoon doing some sightseeing. Georgia is a Christian country with a long history of religious art: historically the Svaneti region was an incredibly remote part of the country and because of this, during times of war, treasures and other religious artefacts were often sent here for safe keeping. However, many of these treasures were not retrieved and as a result, they have remained in the area ever since, making a visit to the local museum a fascinating experience. The other thing that the Svaneti region is famous for, is the 1000 year old defensive Svan Towers that dominate the towns and villages in the area. Families would retreat into these at times of danger and strife. We’ll have the chance to visit the Svan Towers at the top end of town. 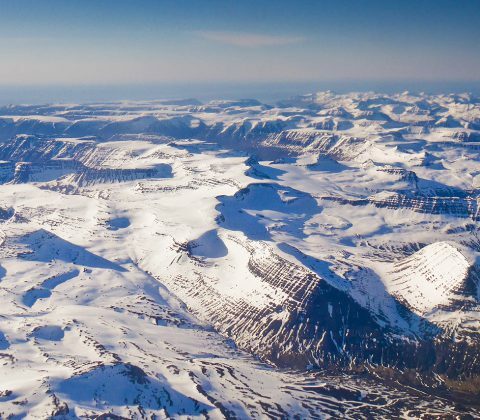 PM Evening Briefing – your guide will run through kit checks and safety routines, before going on to discuss the current weather and mountain conditions and how these affect our plans. We’ll have maps and information on the area to show you, so if you’ve any further questions or last minute requests, then this is the ideal time to bring them up. Warm up day tour/off piste skiing near Mestia. 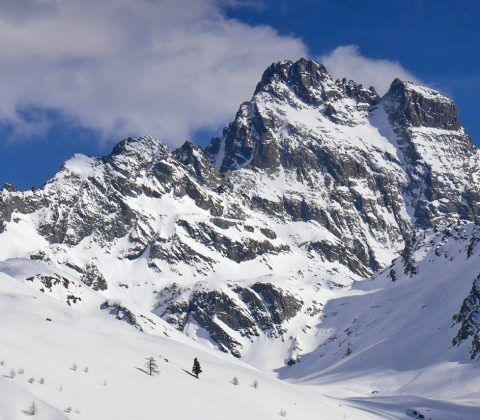 There are two small ski resorts in the area, both of which offer great off piste skiing, plus lift assisted day tours and there are numerous excellent day tours in the mountains surrounding Mestia – we’ll choose a good objective for current conditions. Overnight in Mestia. Ski touring in Ushguli – outings selected to cater for group interest and the current snow and weather conditions. There is great skiing available in all directions – with excellent north facing powder bowls on one side, a lovely panorama summit right above the village and long spring snow tours up onto the flanks of Shkhara (at 5193m, the highest mountain in Georgia). Our accommodation in Ushguli lies at an altitude of 2100m and tours will typically involve 1000-1500m of skinning per day. On Friday we do our final days’ touring in Ushguli, before setting off back to Mestia, where we spend the night. Final ski day and travel back to Kutaisi. On Saturday, we finish skiing mid afternoon and set off back to Kutaisi, spending our final night at our hotel in Kutaisi. In the morning, we have time to do some final sightseeing in Kutaisi – eg visiting the famous markets, the Old City or Bagrati Cathederal – before heading to the airport in the late morning for flights home. Your meeting point for this trip is London Luton Airport, at 13.00 on Thursday afternoon or at Kutaisi hotel/airport. If you plan to fly to Georgia via another route, then you must make suitable arrangements to make absolutely sure that you will arrive in Kutaisi at the same time as the rest of the group – please inform us of your plans if this is the case. Travel out: You need to book on the Thursday 28th February 2019 Wizz Air flight W6 6424 from London Luton to Kutaisi, Georgia departing at 15.05 (5hr flight, arriving 23.55 local time, +4hrs GMT). Booking a Wizz Go Package, plus skis is probably your best option – at the time of writing (July 2018) flights are available for as little as £275 for the return flight, including skis and 23kg hold baggage. Travel home: You need to book on the Sunday 10th March 2019 Wizz Air flight W6 6423 from Kutaisi to Luton, departing 13.10 local time (flight arrives Luton 14.35 local time). We advise you to book 1x Hold Bag and 1x Ski Equipment on all flights. British Mountaineering Council. The gold standard in insurance for UK residents. Very competitive single trip or annual cover for all ski touring and mountaineering activities. Use this link to book your BMC insurance. If you use another insurance provider, then please check terms and conditions very carefully to make sure your activity is covered. Please note this trip is outside European Territorial Limits, so you need to purchase Worldwide (Excl USA/North America) Cover. Global Rescue. Cover offered to all nationalities. Details of your insurance must be sent to us before the course starts, and brought to the course briefing at the start of your trip.